JapaneseAdobo: Thank you for the Love, Kapamilya! Thank you for the Love, Kapamilya! 2015 has been a great year for ABS-CBN Lingkod Kapamilya Foundation, Inc. A lot has happened and we could never be more grateful for the blessings we received the entire year. Every Christmas season is a time to be reminded that our existence is all because of you, our dearest Kapamilya. We serve and dedicate our efforts to our donors and beneficiaries. The world continues to revolve; and with time passing, we continuously evolve into something bigger, broader and better; as our Chairman, Gina Lopez, would say it. This season is no different. We see the spirit of giving even more among our kababayans here and around the world. Thus, we can only be so grateful. 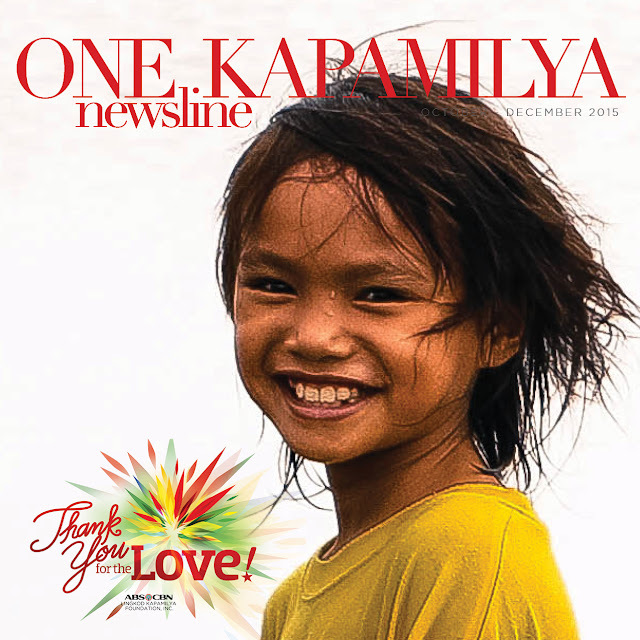 This issue of One Kapamilya Newsline is more than what we have accomplished, this is about our donors and beneficiaries. We serve, we collaborate and we are grateful - grateful for the opportunity and trust to be the bridge between our Kapamilyas who want to help and those who needed the help. This coming year, we face the world in a new mind set. Our thrust being all about one word and one center - LOVE. Everything we envision and do revolves around our love for our family, self, environment and others. May the selfless spirit of this Holiday season be in our hearts the entire year. Seeing this kind of charity works make my faith in humanity restored.